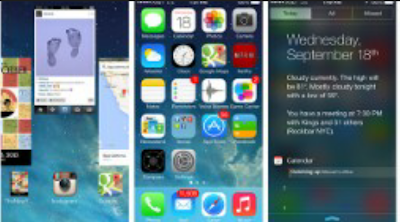 Apple is releasing its latest operating system for the iPhone, iPad and iPod Touch today. The system, iOS 7, will come installed on the new iPhone 5S and 5C models that go on sale Friday. Owners of some older Apple devices also can download it to replace their current systems. But should they? Before you jump in and upgrade, here's what you need to know about iOS 7. Apple's iOS is the software that controls all the basics of your gadget, including the look, feel, settings and hardware. iOS 7 is Apple's latest update to this system and its biggest change since iOS debuted six years ago. What time is the iOS 7 download available? Developers have been testing early versions of the new operating system for months, but Apple made it available to the general public at 1 p.m. ET today. To see whether it is available, go to Settings > General > Software Update on your device, or visit iTunes on your computer. How is it different from what's already on my iPhone or iPad? Six years is a long time to wear the same look. Apple's iOS has received a major design overhaul in this version and now has a more streamlined, flat, abstract look. The typography is all new, and nice touches like transparency and subtle animations abound. • A new time-saving control center slides up from the bottom of the screen for easy access to basic settings such as brightness and Airplane Mode. It has shortcuts for the flashlight, timer, calculator and camera. • An updated notification center now shows a summary of what you have in store for the day and details on the weather and your commute. • The camera adds a square-photo option and new filters, while the photos app drops the map view and sorts your images into events by date and location. • It adds AirDrop, a feature for people who use iCloud that makes it easier to move photos and files between computers and mobile devices. • The Siri voice-search tool adds an option for male voice, defaults to Bing for Web searches and pulls in results from Twitter and Wikipedia. • Multitasking looks different. The same double-click of the home button now zooms you out to show a carousel of mini versions of all your open apps. iOS 7 won't require a great deal of re-learning. The basic layout and functions are the same: The home screen is still a grid of icons, there's a dock with your favorite apps at the bottom, and the gestures you've become used to work the same. There will probably be some initial confusion as you struggle to re-identify all the new icons, but a proper upgrade should leave them all in the same spots they were in before. Can I update my iPhone/iPad/iPod Touch? Although iOS is coming out the same time as a pair of brand new iPhone models, it can also be installed for free on some older devices. At the press event announcing the new models, Apple CEO Tim Cook said there were 600 million devices running iOS. Just because you have a year-old iPhone 5 doesn't mean you can't freshen it up with the latest operating system. Look for your device below to see whether it is eligible. • iPhone 4: Yes. Does not include AirDrop, Siri or camera filters (you can add filters later in the photos app). • iPhone 4S: Yes. No AirDrop. • iPhone 5: Yes. Includes all new iOS 7 features. • iPod Touch: Only the 5th-generation iPod Touch can upgrade but will include all new iOS 7 features. • iPad 2: Yes. No AirDrop, Siri, camera filters or square format, or Photos app filters. • iPad 3rd generation: Yes. No AirDrop or camera filters. Some of the cooler new features you may have heard about, like the Touch ID fingerprint sensor and the new camera tools -- slow-motion, burst mode and image-stabilization -- are available only on the new Phone 5S.